How does ALEC’s business model work? ALEC’s business model is something that we have given a significant amount of thought to, especially in recent years. As a government-funded training organisation we are fortunate to have access to a dedicated funding stream for our main education product, the National Certificate in Adult Literacy & Numeracy Education (Vocational/Workplace) – otherwise known as the NCALNE (Voc). The funding stream for this is known as the Adult Literacy Educator Grants (ALEG) and currently subsidises a big chunk, but not all, of the costs of the training. We pass on other training costs to the organisations we work with as fees for training and assessment. The level of uncertainty around this funding has increased in recent years. And while we have a product that is in demand, our increasing lack of confidence in the existing funding stream has forced us to consider ways to drastically reduce our fixed costs and become a much leaner organisation. We use the Business Model Canvas to describe, visualise, and assess our existing business model. You can see the latest version (May 2014) above following our recent restructure which included closing our local offices and shutting down our local Intensive Literacy and Numeracy (ILN) programme that ran from 2010-2014. Click the image if you want to see the detail. 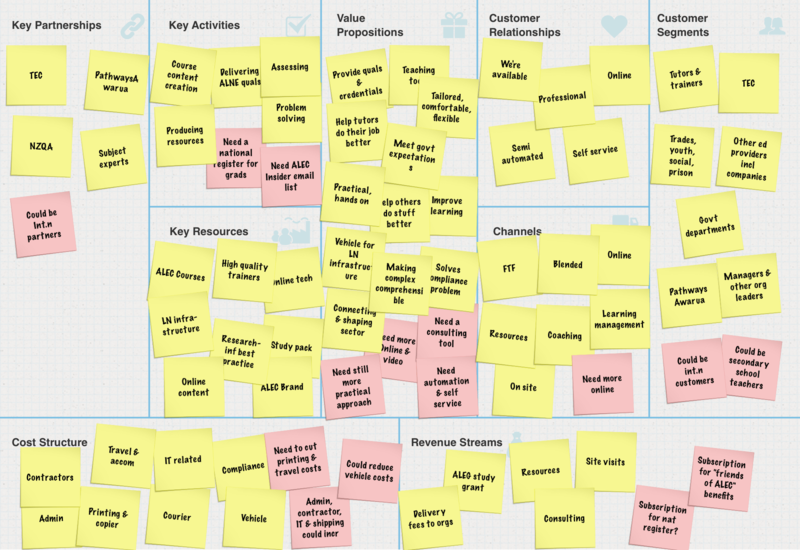 Yellow sticky notes represent what we’re currently doing or working on, and pink stickies are area where I think we can grow, improve, or develop. Next Using the Business Model Canvas: What are ALEC’s Value Propositions?